WANTED! Evil Teachers . 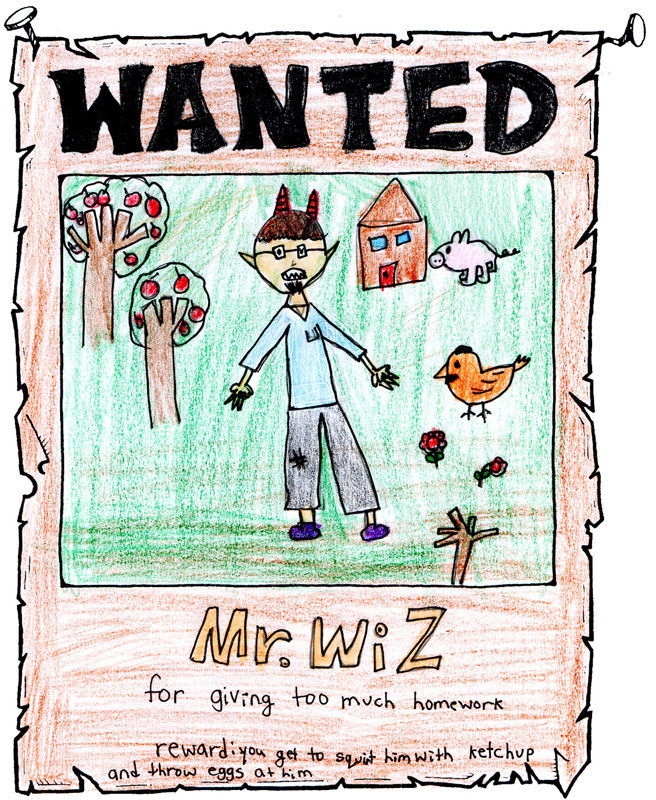 . .
As part of a class on story-starters, my students created some wanted posters. Big surprise—many of them chose to focus on ME. In the first one, you will notice that my sweet Abbey sees me as someone with horns, claws, and fangs. 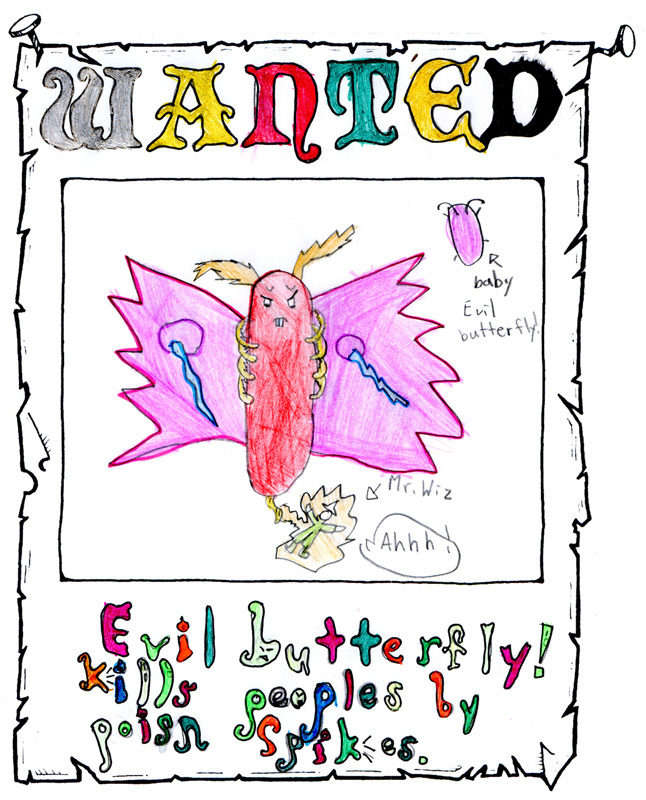 In the second, it seems I get my comeuppance from an evil butterfly. Hmmm . . . neither poster portends a kind future for me! These are the words that Kendra hears upon her visit to a very ancient oracle in The Crack in Kazah. The sorceress who utters this cryptic statement is indeed blind, but explains to Kendra that her very power comes from that which ails her. She is one of the most powerful magic-makers that the land of Een has ever known—more powerful than even Uncle Griffinskitch and Winter Woodsong. Kendra’s visit with this oracle will cause much concern for our your heroine, especially as she is given a glimpse into her own future. Indeed, the words of the blind oracle will not only be instrumental in determining the outcome of Kendra’s adventure in The Crack in Kazah, but for her emotional journey in Book 5. I had a lot of fun creating the oracle and her entourage of elders. Many of these elders are animals, while her captain of the Een guard is a ladybug (much in the tradition of everyone’s favourite grasshopper, Juniper Jinx). I finally have gotten around to posting the beautiful artwork that one of my students created at the recent camp I led in Korea. 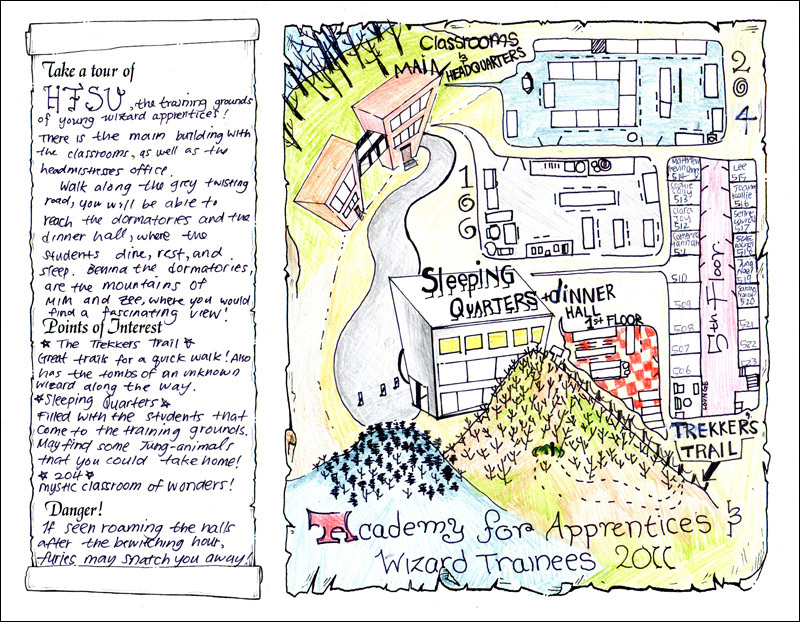 For this project, students were meant to create travel brochures for a magical land of their own invention. Sarang, being the oldest (and a camp counsellor), decided to do a brochure for the actual camp. It’s absolutely wonderful. On the cover you can see an illustration of myself, fellow teacher Kallie George, and even our camp mascot, Prospero the snowy owl. This brochure is meant to be a three-panel affair, doubled-sided and folded twice. I’m just showing you the spreads before they are printed. I was so pleased to see Sarang’s creative approach to this project. She is actually the student who helped me when I wrote Kendra Kandlestar and the Shard from Greeve. Not only did she pre-read the whole book, but she helped me name Captain Raggart Rinkle and the sea monster known as the scoptacus, and even helped me fill in the back story for one Captain Dirtybeard. 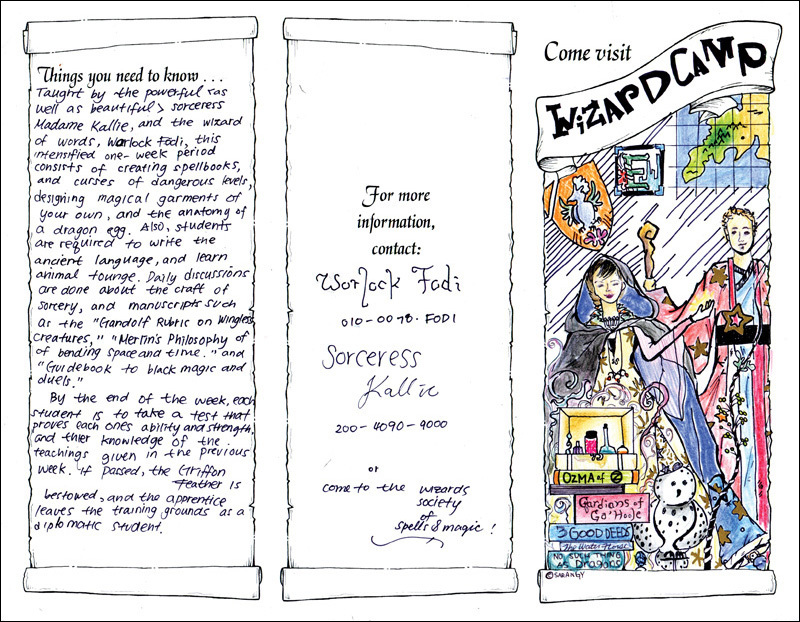 I’ve been logging long hours working on the illustrations for Kendra Kandlestar in the Crack in Kazah. Here’s one of my recent illustrations, depicting the attack of Agent Lurk (and his skarm) on the Kendra and her companions aboard the cloud ship. My goddaughter, Charlotte, has been campaigning to have a character based on her in Kendra Kandlestar and the Crack in Kazah. I tried squeezing her into a minor scene, but then ended up deleting the sequence during the editing process. It was such a small scene anyway, with just a mention of a new character, so I decided it wasn’t worth throwing an obstacle into the middle of the story to slow it down. So, now Charlotte has started building her case to be in Book 5, which has been greatly helped by this delightful character design. Meet Lotté Luana. You will notice she has one long braid, which I can’t help thinking would somehow play into the character’s role. We haven’t quite fleshed out what Lotté’s story is, but I’m sure this is something Charlotte will be working on over the coming months. So, if YOU were an Een, what would YOU look like? Here’s a drawing I’ve done this week of one of the villains who features prominently in Kendra Kandlestar and the Crack in Kazah. This character is just a thirteen-year-old boy, so may not seem that ominous, but trust me—he plays a major role in the events that shape this book! He’ll also figure prominently in the next Kendra book (though I’ll confess, I’m just not sure what will happen to him quite yet). By the way, I’m almost getting ready to turn over the manuscript to my publisher. It’s close! One of my students (but don’t worry, Matthew, your identity is safe here) is fascinated with owls. In fact, when I mentioned that there would be owls in Kendra Kandlestar and the Crack of Kazah he promptly began interrogating me. “What species are they? How many owls? What are they going to do?” Well, Matthew was so kind to even provide me with some owl research and, after reviewing his data, I decided I would go with snowy owls. Here’s a couple of illustrations I’ve completed so far of the main snowy owl. I hope they meet Matthew’s satisfaction! There’s supposed to be one other owl in this book. I think I will make it an elf owl; seems appropriate for the Land of Een!